Around lunch on Sat, we leave for Brest, with a stop in Tarare to collect antifouling paint and reach the Imram in the night. After the transfer from St Malo to Brest in January 2006, the Imram has spent the rest of the winter moored at the quay in . After the locks of Guilly Glaz, the boat is in salty waters again. On its way motoring to the Rade de Brest, the Imram meets its younger and bigger brother, the Viskoulen of Pascal & Marie. Once in the Rade, we hoist sails and the Imram loses its status of "peniche". Quick check of the various lines and we moor in the Moulin Blanc harbour. Three years after receiving its first antiflouling coat (in June 2003, in St Malo, before leaving for Greenland), it is about time to renew the protection of the hull: wakeup at 6 am, drying out, cleaning with pressurised water and a ride by travel-lift to the boat storage area on land. Sofar so good ... but the Imram has 35 m² of wetted area, all of which needs to be sandpapered manually to rid the boat of the fresh-water mini-shells from Port Launay. Meanwhile, the raft is sent to Gloaguen in Concarneau for refurbishing, further paint is collected in Plongour Lanvern, and the jib goes to Incidences in Brest for repair. On Tue we start repainting hull, rudders and deck. Peter leaves in the afternoon. Wed afternoon, the boat is already back in the water. Moored next to the boat of Bernard Stamm, Anja has no difficulty locating the Imram on arrival from Geneva late Wed evening ... Next day, she actually gets invited on-board by the skipper in person ! Salvatore arrives together with Anja and Pascal reaches Brest Thu at lunch, thus completing our crew. The last charts and pilot books meanwhile arrive at the Capitainerie and the local ship chandler. By Fri morning, July 14th, we're ready to leave, except that we still need fuel. In principle a triviality, were it not that a beautifully shining blue boat all but blocks the access channel to the fuel station, with a 4 Bf wind abeam. Fuel at last being taken, we leave the Port du Moulin Blanc ... the first time the boat is sailed without Peter on board ! We're a bit early for departure with evening HW, so we do some manœuvres in the Rade, and then set off for the Isles of Scilly. Les préparatifs étant terminés, nous décidons, après une longue attente de va-et-vient devant la pompe à essence, de larguer les amarres et d'entamer notre première traversée vers les îles Scillies. La météo est favorable avec un vent de 4- 6 Bf NE et la mer est agitée, toutes les conditions réunies pour mettre à rude épreuve nos estomacs pas encore amarrinés ... Nous passons en fin d'après-midi au SW des îles d'Ouessant et après une bonne estimation de notre route, nous voyons se pointer à l'horizon les îles Scillies. Enfin le moment tant attentu de savourer notre première "pinte" de bière au pub le Mermaid ! The weather forecast is favourable - good weather and 4-6 Bf NE. In practice, the wind is towards the upper end of this range, with only occasionally stronger gusts. Prudence prompts us to take the somewhat longer route SW of Ouessant. Approximately half- way, we discover that we've picked up a stowaway, a homing pigeon. He (or she ?) quietly sits on the halyards and doesn't object when we move him around to adjust the sails. We reach the Isles of Scilly Sat late afternoon - well in time for a beer at the Mermaid. The pigeon, seeing St Mary's, decides to leave us. No motor (except for departure and mooring), and no GPS used. The latter is an achievement given that we're equiped with a log of which about a third of the relevant pixels fails to work. Salut. Just arrived and anchored in Scilly. Excellent conditions. 6bf. 6knots with 2nd reef no jib. 8 knots with jib. Arrival from the south straight on target. No GPS. All happy. Starboard compass light does not work; any spare bulbs anywhere? Email doesnt work, PC misses driver. Log display damaged. Par un magnifique coucher de soleil, nous quittons les Scillies pour traverser vers l'Irlande. Les prévisions météorologiques sont favorables pour ces prochains jours et nous décidons de passer par la côte ouest de l'Irlande. 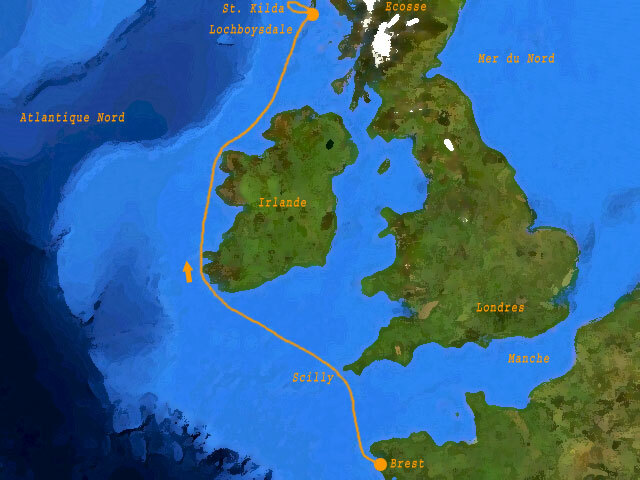 La traversée fut calme et agréable, une légère brise constante nous a accompagné jusqu'au Fastnet rock, phare mystique qui indique l'approche de la côte irlandaise. A l'aurore, nous entrons dans la baie de Bantry pour finallement arriver, après avoir longé la côte intérieure sur plus de 18 M, à Glengarriff. Nous prenons l'annexe pour aller au village et durant le trajet, nous constatons qu'une petite île, jouxtant le port, est à vendre. Par contre, quelle ne fut pas notre surprise en débarquant à terre quand nous découvrons, juste en face du ponton, une pancarte qui indique que l'église est à vendre... La visite de Glendarriff s'est achevée par la dégustation d'un plat local, morrue et biensûr accompagné d'une bonne pinte. Dans l'après-midi, au moyen de l'annnexe, nous sommes allés visiter les îles environnentes. Là, sur de gros galets, se doraient au soleil une quantité de foques, qui nous ont inspirés à faire de même et terminer par une bonne sieste ! Leg marked by the first incident-free departure from the Isles of Scilly: both in 2003 and in 2005, engine problems made the stop definitely eventful. Leaving at sunset, we have a steady breeze for the first half of the crossing to Ireland. Later, the wind dies but the excellent weather remains. At midnight Mon to Tue, we pass within a few cables N of the Fastnet rock, thus completing the rounding of this racing mark (we had passed to the S of the rock in 2005). After rounding the cape, we enter Bantry Bay heading for Glengarriff (Gleann Garbh). Glengarriff does justice to its Riviera reputation: the temperature is 31 C. One of the more famous Irish anchorages, and founding place of the Irish cruising club, the place is remarkably beautiful with its numerous small islands and seals, surrounded by green hills - a cross-breed between a Mediterranean and a Scandinavian landscape. Anchored in Bantry bay. Fantastic! Relaxed crossing, 3bf calm sea. We are planning to leave tomorrow morning to Inishbofin (with Killary harbour as back-up solution). Weather is expected to be fine for 2 more days. Reminder: spare mèche de safran are needed. We still do not have a copy of ATT NP201-06, no real problem though. On the morning of our departure, the vast high pressure zone over Ireland decides to turn cyclonic and much of the leg therefore took place in the haze and drizzle more usually associated with these isles than the weather we sofar enjoyed. Inishbofin only emerged when we're a mile from the distance, after an approach by radar. Once nearby, the harbour entry transit is well visible - which is fortunate given the narrowness of the entry. In the harbour entry, the echo sounder decides that it is getting too cold. Henceforth, it refuses to show soundings when this could be useful. In exchange, it does regularly show remarkable readings in open water. Soon after arrival, the weather clears up. Gradually, the harbour fills with sailing boats, with an accordingly crowded pub in the evening as a result ! Weather remains good on Thu, reason for a hike in the hills of the island. Anchored in Inishbofin. All fine. Very smooth crossing. Info: we do not have specifications for engine oil, hence no oil yet. Pleas confirm meeting day in Lochboisdale. Rashers and eggs for lunch after the hike, then departure between the islands off the coast and ... on to the Hebrides, some 220 M from here. Anja has meanwhile become an expert in working out distances and courses between coordinate points, as well as in doing the transformations between rhumb lines and great circles. Needless to say that no GPS is used. Light winds at first, but a steady fresh Easterly breeze all of Sat as the fronts pass that are associated with the low pressure zone to the W. One thunder cloud passes straight over us in the night. Sun morning, the steep cliffs of Barra Head emerge from the clouds - the sure sign that we've arrived in the Outer Hebrides and a good occasion to have breakfast with the Hebrides Overture by Felix Mendelssohn-Bartholdy (granted, this was composed with Fingal's cave in mind, which is not exactly nearby). Around lunch time on Sun, we reach Castlebay (Bágh a' Chaisteil). A quiet village, with a surprisingly large number of sailing boats - many showing Tallisker flags. After a visit to the excavations of a neolithic settlement, we go for a hike over the hills and then ... to the pub - as usual. In the pub, an elderly couple, with musical instruments, from the nearby island of Vatersay tells about life when they were young. Circumstances in those days are hard to imagine nowadays - while since 1991 a causeway (just 250 m long !) connects Vatersay with Barra, Vatersay used to be inaccessible for days. Given the shallow waters, only tiny boats could be used to transport good, people and cattle to and from Vatersay. Scottish weather comes in a number of variants: lovely Scottish weather means that it doesn't rain continuously, one may actually see the sun at times; with fine Scottish weather, it will of course rain continuously, but it should not snow much; with fair Scottish weather, the July blizzards may still be manageable and one doesn't want to imagine what poor Scottish weather would be like. So on Mon morning, we decide to go for a cream tea - in the open air, it is fine Scottish weather after all. Not surprised in the least, the lady of the place kindly supplies plastic sheets to be put over the benches so that we remain dry from below. Eating sufficiently fast, we also manage to keep the scones dry. It has to be sayd that everything we ate there was of remarkable quality: not only were the scones freshly baked, even the bread used for an, in every respect superb, sandwich of locally smoked lamb and locally grown (organic) greens, was made on the spot. The low pressure zones keep arriving and we sail to St Kilda with tailwind, mostly in the fog and haze. Levenish appears when we're only 5 miles away. Soon after, also the amazing cliffs of St Kilda emerge out of the clouds. After mooring in Village Bay, Anja's birthday breakfast is served: pancakes, clementine marmelade from the Isles of Scilly and other goodies. The island has been inhabited for at least 1000 years until 1930. In that year, the last inhabitants were evacuated - life on the island, which had always been very tough, had become unsustainable. Volunteers for the Scottish National Trust have, over the last 40 years, done a truely remarkable job reconstructing the village as it existed when it was abandoned. Their dedication is only rivaled by the quasi religious care with which the army has succeeded in destroying the charm of the place with a cold war missile tracking station, implanted near the heart of the village with a giant generator buzzing all the time, cars driving to the radar on the hills and helicopters bringing in supplies. Anja's birthday dinner, announced to consist of appetisers, several primi and a cake, prompts for a walk. St Kilda has to be visited to be appreciated - Village Bay is probably a former glacier bowl with smooth slopes rising to about 400 m. Hardly any tree grows there - an indication of the high winds which sweep the place. All around, stunning vertical cliffs rise from the sea. The fog banks perhaps even enhance the views. It is only when travelling to Geneva that one realises how remote the Outer Hebrides really are: it starts with a 6 h ferry boat ride from Lochboisdale to Oban, then after several hours of waiting, two train rides of 2 h each to Edinburgh, a bus ride of an hour to the airport, again several hours waiting a plane to London, a 1 h bus ride around London and another plane to Geneva ... all in all, some 36 hours.